IN MEMORY: Book artist Maria Pisano with Hectacombe, a book she created in reaction to the bombing of the Twin Towers on 9/11. Princeton-area resident Maria Pisano is a petite woman with a huge talent. To say she “makes books” is an understatement. What she makes are one-of-a-kind artists’ books that are, invariably, both beautiful and provocative. She starts from scratch, making her own paper, using images she has drawn or taken from photographs, and doing her own printing and binding. Ms. Pisano observes the world’s foibles (as in “Hand Maid,” a work-in-progress about stereotypical perceptions of women), its tragedies (“Hectacombe 9-11,” another work-in-progress, is about the bombing of the Twin Towers), and childhood memories (“Tempo Allegro,” a carousel book, recaptures the magic of family visits to the beach in her native Italy). Her works are in numerous private and public collections, including the Library of Congress, the Whitney Museum, the New York Public Library, the American Art Museum, and the National Portrait Gallery. She has published articles in the book arts publications Tabaellae Ansatae and Dog Eared Magazine, and curated many exhibits. She teaches all aspects of the book arts, including papermaking, printing, bookbinding, and conservation. Ms. Pisano’s work will be on exhibit at the Philadelphia Atheneum in June. In the meantime, some of her works can be seen on the Book Arts Website at www.philobiblon.com, under the exhibits link. She can be reached at MGPstudio@AOL.COM. Each book has its own unique aspect. Creating a book doesn’t happen in a week or two. It takes years — I keep going back. Then the missing component appears. I have plenty of books waiting to be finished on my shelves. It’s a process. The text, image, and theme have to come together. 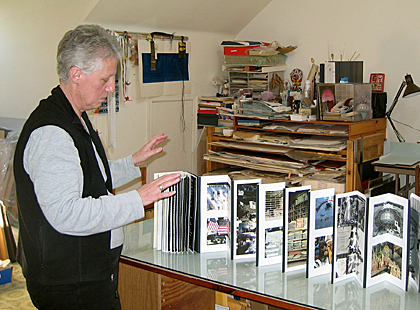 Right now I’m working on Hecatombe 9-11, an accordion book designed to symbolically represent the twin towers. It’s a memorial book that tries to come to terms with this open wound. It incorporates all the victims’ names and ages, along with photographs of destroyed buildings, and the impromptu memorials created by loved ones. It is dedicated to those who have sacrificed their lives to protect our freedoms. It’s a very quiet, reverent book. On the lighter side, I’m also working on Tempo Allegro, a carousal book filled with images of fish swimming in the ocean. It has pop-up elements. I created Tempo Allegro with handmade paper and gouache, and laser printed it. It’s about being young and innocent and unencumbered. The ocean has always been a catalyst, bringing wonderful, oblivious days back to the present. I recently visited an old penitentiary in Philadelphia and was so struck by the cells, the cots, the light falling on the walls. I tried to imagine the people there. Artifacts have so much life; when I saw a letter written by Thomas Jefferson at the American Philosophical Society I could sense the anima in it, the soul that speaks. When I work I get lost in time. It’s not drudgery; it’s very innate and it just flows. I love the tactility of papermaking, and paper’s fragility or denseness. I love the smell of the ink. Wassily Kandinsky and Giovanni Battista Piranesi are among my favorite artists. Piranesi is such a fantastic printmaker. It’s lonesome working alone. You’re working in a void, and sometimes you want a sounding board. But the purpose is to reach people outside your small world.